Sometimes, you just can’t get to the golf course. Obviously, you would love to be at the course either practicing or playing as much as possible – but real life tends to get in the way from time to time. Unless you are a professional golfer, you have a job to worry about, and you may have family obligations which take some of your time as well. In other words, you can’t plan your schedule around practicing golf all day, every day. With that in mind, it is a good idea to find another way to practice when you aren’t at the course. Thinking about practice away from the course naturally leads to the topic of indoor practice nets. 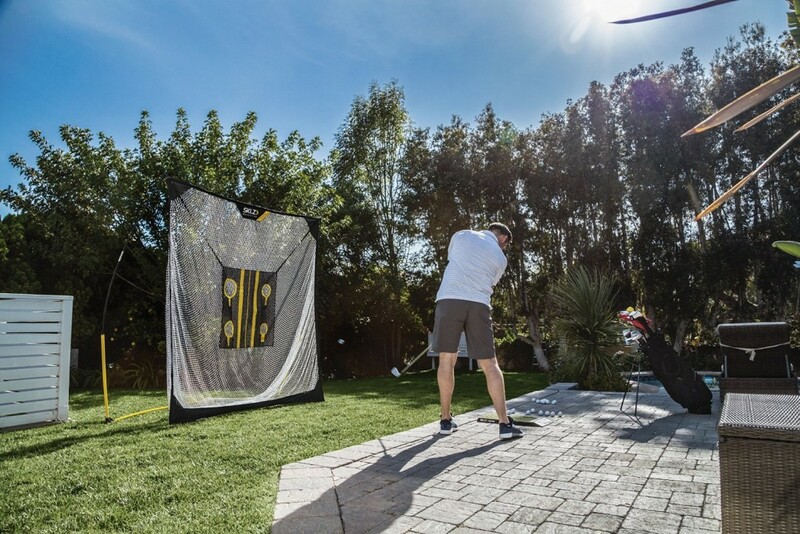 By putting up a net somewhere in your home (the garage is a popular spot), you can make swings even while you are nowhere near a golf facility. Of course, you will need to have plenty of room at home in order to make swings, so do some measuring and testing before you order a net of your own. Some golfers mistakenly believe that they shouldn’t bother with getting a net for home, since they aren’t going to be able to see the ball fly into the distance as they could at the range. While it is nice to watch the ball fly, there are still plenty of benefits to having your own net at home. The simple repetition of making swing after swing will do good things for your performance from a consistency standpoint, and you will be building up your ‘golf muscles’ as well. Make no mistake – hitting balls into a net isn’t quite as productive as practicing at the range, but it is a very nice alternative. If you have decided that you are in the market for an indoor golf net, check out the models below. To start off our list, we are going to do it right – by taking a look at one of the top options on the market today. The Net Return Pro Series is a high end product that comes with a pretty significant price tag, but it also has plenty of features which can help you play the best golf of your life. The design of this net, as the name would indicate, encourages the ball to come back right to you for another swing. Also, it is easily assembled in just a few minutes, so you don’t have to waste all of your valuable practice time putting up and taking down this product. Of course, you will need to have significant space available to use this net at home. It is 7.5’ tall and a full 8’ wide, so make sure you have the right area set aside for your practice before you choose this product. Also, a hitting mat is not included with the purchase, so you will need to acquire that piece of practice gear as well before you can get started. Made for use indoors as well as outdoors, this net is extremely versatile. Furthermore, the net can be transported in a duffle bag and only weighs 28 pounds. On Amazon, 89% of reviews on this product are 5 stars, which is extremely good. A few people note issues after long use of the net with holes arising in the net itself from constant ball striking. As previously mentioned, there is no net with this product, and that is a major hassle. If you use the net in your yard, you will have to find a level hitting surface as well as alternate hitting locations. Each one will get tremendous wear and tear as you proceed, so to avoid longterm damage, you will have to move. Most reviews seem extremely positive about the set-up and take down of the net. This is quite important as many nets cause users hassle and a lack of reliability for setting up. This net is certainly not a bargain, but the consensus from users is that the product is worth the price. 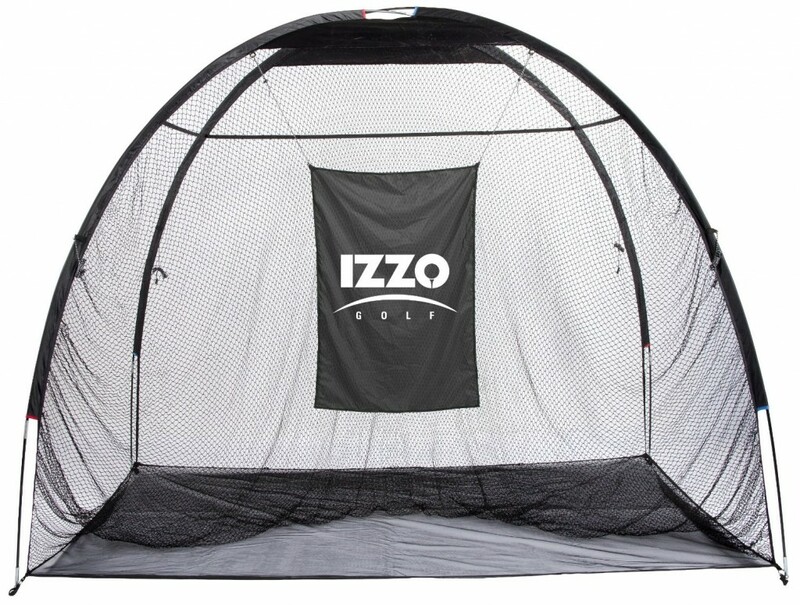 For a less-expensive option that will still get the job done, take a look at the SKLZ Quickster Golf Net with Target. This is a product that can be used both inside and outside, depending on your needs and preferences. The ‘quickster’ name would indicate a fast put-up and take-down time, and that is exactly what you should expect. Once you get the hang of how to set up this net, it should take barely more than a minute to prepare for use. If you are going to be using this net indoors, you will most likely want to acquire some soft golf balls to avoid doing damage to your property as the result of an errant swing. If space is a concern for you when purchasing a net for home use, this is a model to keep in mind. While it will still take up a fair bit of indoor space, it is not as expansive as some of the other models on the market. Of course, this means that it may not catch as many shots (depending on your skill level), so think carefully about your own personal needs. 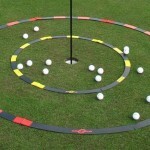 Also, this is a great option for kids if you would like to give them some practice time as well. Another perk of the net is it is adjustable to be positioned for either full swing or pitching work. That is a rare perk with nets. Only 67% of reviews on Amazon are 5 stars which is a little concerning. One fault people cite is if the wind is being used in the wind, the netting is a little flimsy and will bend with the wind. Over time that may cause wear and tear to the net. That being said, if you are not in the wind often, the slack in the net may be a perk for you since it deters the ball from bouncing back at you. Despite potential blowing in the wind, reviewers seem confident in the net’s strength when it comes to handling various clubs. Numerous reviews cite the successful use of clubs ranging from irons to their drivers. Overall users seem quite satisfied with this option. If you are looking to save a few dollars, but find a net that is flexible and easy to store/set-up, this could be a very good option for you. The IZZO brand name is one that is well known to golfers, as they offer a variety of products and accessories. In this case, their offering is an indoor/outdoor hitting net that includes a huge opening to catch all but the wildest shots. Impressively, this model is a full 10’ wide, which is 2’ wider than the first net on our list (which was pretty big in its own right). Also, this net is 8’ tall, which means one thing – you are going to need a significant indoor space to set this net up for practice sessions. 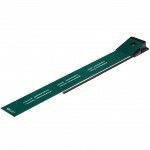 In addition to its large dimensions, this is a product that has been built to last through the use of quality materials. Also, it can be folded up and put away relatively easily, so if you don’t want to leave the net out all the time, you won’t have much of a problem putting it in storage. 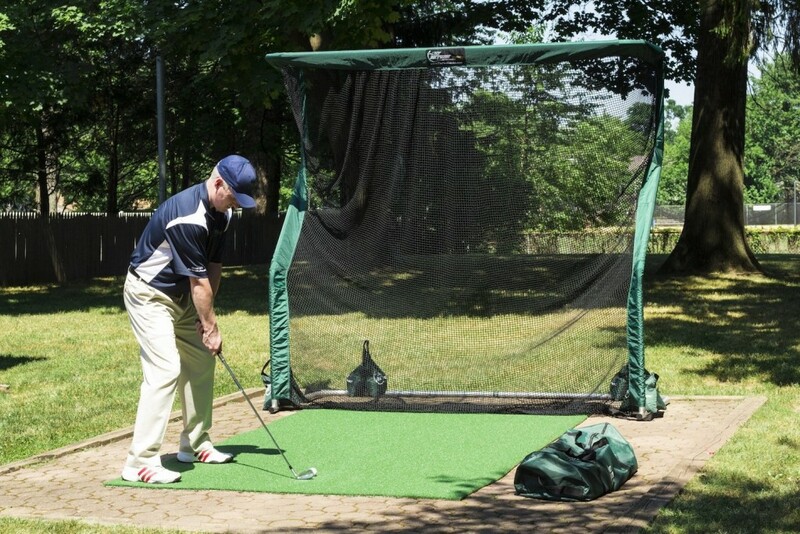 The ability to use this net both inside and outside is another nice bonus, as you will be able to decide where you would like to practice on any given day. The average review for this product is 4 stars, which is not the best. Numerous reviews stress a difficulty in putting the net together. Once it is set-up most reviews are quite positive on the strength of the netting. Another problem many users cite is being required to fully disassemble the net each time they wish to store it. Considering the set-up can cause issues, this is not promising if you need frequent storage. When you get ready to place an order for a practice net, there are a couple of specific points to keep in mind. Obviously, the size of the net if the first important consideration to make. If the net is too big for your home, or too small for your purposes, it will be useless to you. Figure out exactly how large you would like your net to be, and then pick out the appropriate model on sale today (possibly one of the three listed above). Another point to consider is the strength of the net and its durability over time. Hitting golf shots can put quite the strain on a net, so you will want to make sure to buy a high-quality product if you are a powerful player with a big swing. Even if you don’t regularly blast the ball 300 yards down the fairway, you can still do some damage to a net when you hit one just right. There is no doubt that an at-home net, such as one of the three on our list, can help you play better. Between the repetitions that you will get to ingrain your technique and the muscles you will build, you can look forward to an improved golf future thanks to this one purchase. Have fun shopping and play well!